GS3 4-20x50 is rated 4.7 out of 5 by 15. Rated 5 out of 5 by Tony M from Great features and build quality I recently purchased the Steiner GS3 4-20x50 to replace an older model mid tier 3x9 gold ring that is more than 30 years old . The old scope still works fine but I am hoping the Steiner will give me some longer range options for my Remington 700 - 7mm mag. I really like the optics clarity, especially at lower light levels but have not had a chance to actually hunt with it yet to test out the "game sensing" feature. Shooting with it at the range at both short and long distances, further convinced me this was a good decision. The Steiner is built like a tank and comes with one of the best warranties in the industry so I hope to enjoy it for many years to come! Rated 5 out of 5 by DanLongshot from Best for the money! Just bought this scope at Easthill Outdoors in Ont. Canada, my favourite shop. Put it on a Sako Finnlight 270 WSM, with Optilock bases and extra low rings and took it to the range. It's mid January at -20C with a good wind and shot 5 quarter sized groups at 200yds. I can't wait to try it at longer distances. Great package, awesome products! Rated 5 out of 5 by Jay Banks from Excellent optics This is the second scope of this type that I have purchased. I bought one last year to go on my 7mm Rem mag and had great results so I purchased one to go on my new 6.5 Creedmoor. I have a total of 8 Steiner scopes. I am completely satisfied with its clear glass, light gathering quality and overall performance. You cannot go wrong with Steiner optics. Rated 5 out of 5 by ReichArms from Get what you pay for. I have wanted one of these scopes for years but could not get over the price point in my budget. A local store of mine ended up having a clearance sale on Optics so with $350 off.. I could finally buy one and justify the money. The scope is just as clear and nice as you would expect from Steiner or most German scopes. Highly recommend it. Rated 4 out of 5 by Murdock from Quality Product Purchased a few weeks ago for a new rifle build I am working on. The clarity is great compared to most everything in it's price range. I am mounting on a 1 pc rail so the lack of mounting surface was no issue. It tracks well and runs a box test like a dream assuming you take the time to do a proper install. Clicks are crisp to the feel and light but audible to the ear. It's heavy but not excessive and for most of my purposes a non issue. I would like to put Butler flip-up scope caps on my GS3 4-20x50. Could you tell me what size caps would fit this scope? All Steiner Optics are rated to withstand beyond the recoil impulse of .50BMG in both directions of recoil. Hi! Two questions. I will be mounting it on a Sig SSG3000. &nbsp;Do you have any recommendations re: rings? Can one estimate range with the reticle hash marks? I.e. how many inches from the first elev. mark from zero at 100, 200 yds etc? Thanks! The subtensions of the reticle will vary between the S1 and S7. For specific measurements please contact customer support at 888-228-7747 and they can provide you with the subtensions as well as advise what the hash marks will indicate in yards. Not a big deal for me but does this scope have threads for anti-glare or sunshade attachments? Also, at what magnification levels are the S1 reticle accurate at? I couldn't find the reticle user guide mentioned in another answer. The reticle is accurate at maximum magnification. We do not manufacture a sunshade for the GS3 riflescope. We do not offer custom turrets or dials at this time. 1. 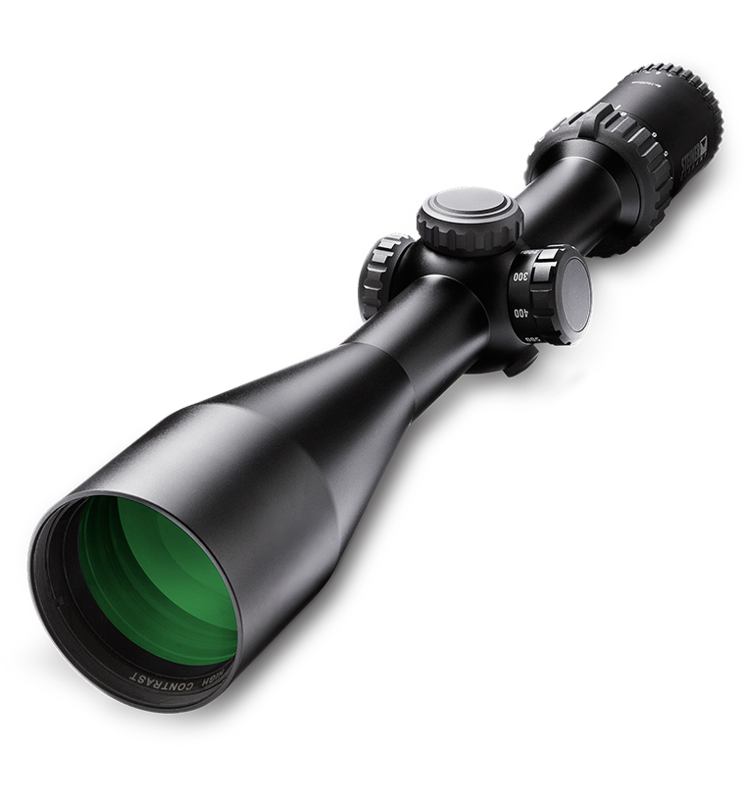 Why don't you offer this scope with dial turrets - it would make it an excellent LR Mountain scope. Not real useful without this option. Can you purchase after market turrets? 2. What is the length - you show both 14.9&quot; and 16.4&quot;. 14.9 is the correct length.